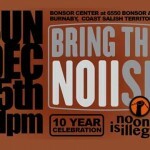 » Home » Past Events » Event: Bring the NOIIse! Please RSVP so we have # estimates for food. Event and lunch is free. Donations welcome to support NOII’s ongoing work. Speakers and performers Khaled Barakat, Dalannah Gail Bowen, Alejandra Lopez, Kanahus Pelkey, Sozan Savehilaghi, Rup Sidhu, Gurpreet Singh, Unist’oten Action Camp, and others. community with all of you! Excited to announce one of our speakers! Roxanne Dunbar-Ortiz is a veteran Native, socialist, and feminist activist, having been involved in revolutionary movements since the 1960s. In the wake of the Wounded Knee Siege she became active in the American Indian Movement and the International Indian Treaty Council. She also helped to develop the Department of Ethnic Studies as well as the Department of Women’s Studies at California State University. She was integral in anti-imperialist movements, making over one hundred trips to Nicaragua and Honduras in the 1980’s to monitor and lend support to Latin American movements during the Contra War. Roxanne has authored a number of books including Outlaw Woman: Memoir of the War Years, The Great Sioux Nation: An Oral History of the Sioux Nation and its Struggle for Sovereignty, Indians of the Americas: Human Rights and Self-Determination, and Blood on the Border: A Memoir of the Contra War. This is a child-friendly event so please do bring your children and we ask everyone to please respect and celebrate that children will be in the space. There will also be free childcare on-site in an adjacent room. Please let us know if you have any specific childcare needs and any pertinent information (eg allergies). We are expecting approximately 25 children so if you are able to let us know the age of your child in advance that would be helpful. The lunch we are serving is wild salmon (from the Heiltsuk nation), there will also be vegan and vegetarian and gluten free chickpea stew. Punjabi and Farsi. We are in the process of confirming further languages. Please note some of the speakers will be briefly speaking in their own (non-English) languages – given our organizing in communities of colour and anticolonial self-expression, these presentations will not be translated into English. There will be ASL interpretation and the video we are screening will be captioned. We will have one-zone bus tickets available at the welcome table. If you are coming from the DTES area, there will be a van providing free transport at around 12:30 pm. entrance is equipped with an automatic door. The room where the event is being held is on the 2nd floor, access to which is by two flights of stairs or a wide elevator. The room has two large inward swinging doors and is wheelchair and scooter accessible, as are the bathrooms on the floor. For full accessibility information, click here. noii-van@resist.ca. If you are willing to assist us in any of the above, we would greatly appreciate it and please do get in touch! Thank you.